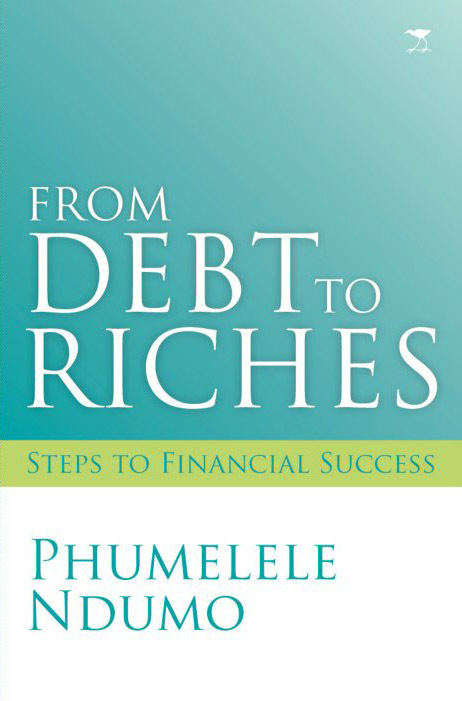 Phumelele Ndumo has written two books: From Debt to Riches and 7 Secrets why the Rich own their homes. From Debt to Riches – Steps to Financial Success is an easy-to-read guide. It will help you avoid getting into debt, help you get out of debt and stay out of debt. This quick, practical read is a must for South Africans who need pragmatic advice free of jargon and complex financial concepts. If your store doesn’t have a copy then e-mail Jacana Books. I am a single parent of 2 beautiful souls, 17 year old girl and a 4 year old boy. I am working as a Rep.
May 2014 winding time between calls in Sasolburg I entered CNA. I came across one copy of this wonderful book “From Debt to Riches”. Then I was swimming in debt not even having money to buy a copy R130. Just reading the title renewed my hope that I could get out of the debt I had gotten myself into. I just knew I could stop renting and own a home if I managed my money well. After 15 months of following your advice from the book, I paid off some personal loans and credit cards, though I am still left with a few. I am so glad to tell you I will be moving to my first home soon. I am also encouraged by the fact that one needs to start small and do it well. Now I need in-depth financial advice. How do I get a financial adviser? Thanks for your book “From Debt to Riches”. It is so practical. I think that is your best gift to humanity. I have just finished reading it. I have given a copy to my wife so that we start speaking the same financial language. I will give copies to all my friends on their birthdays. There is one thing that you did not touch on, which is worrying me. Apart from straight debt (bond, car loan, credit cards etc.) where do monthly expenses like telephone bills, internet accounts, etc. fit in? For example, can I classify my telephone contract line as a debt? I have no credit cards, car loans, or bond but I do have lots of fixed monthly charges in the form of cell phone and internet bills. I have read your book “From Debt to Riches” and found it enlightening and empowering. I personally believe that it is a book that every woman should read and have. What a wise woman and a brilliant book! This book really is meant for us black people as we spend very carelessly. We like to impress people with expensive cars & designer clothes hence we buy these things on credit. I love the book so much and I read it over & over again. I wish I had bought this book two years ago; I would have been in a different position by now. Thanks Phumelele so much, may God Almighty increase your wisdom and help poor people out there to get out of debt. What a book! Congratulations on your book. What attracted me to your book is the cover…simple and nice. I hesitated buying though because I didn’t believe I had much debt. Three months later I felt the urge to buy the book because I am naturally curious. I am not giving my copy away as I need to refer to it now and again. I have recommended the book to all my friends and colleagues. I struggled to get a copy of your book as the bookshop near me didn’t have a copy but finally I got it. Thanks very much! I am on my way to financial freedom – right now the climb is still very “steep” though – like climbing Mt Kilimanjaro – but I am very happy. I no longer have an and no more new debit, Lord help me. Where was your book when I was younger? I guess it is better late than never! God bless, always. Just a short note to express my gratitude after reading your book FROM DEBT TO RICHES. Thanks a million for the information I received, its life changing, destiny altering and liberating. My attitude about money has changed. I am also a youth Pastor and would like to know if you also do workshops, I feel our young people definitely need this advice as early as possible. My name is Siphumelele and I’m a 23 year old woman from KZN. I went to Exclusive Books in search of books about wealth and how to accumulate it and reduce debt when I found From Debt to Riches. WOW… I was so happy to find a book about the subject written by a South African living in the country who understands my experiences. I bought a car almost a year ago and I know I can’t afford it. I’m paying R4 300 which is just a bit more than the minimum repayment (R4 052) and the interest rate is linked to prime so it changes with the change of the prime rate. Its currently 12.26%, and I’ve made a commitment to myself to pay R4 500 from my bonus each year. I also have a balloon payment which is about R60 000. This car loan is my only debt. I don’t have a credit card, store cards or any furniture store accounts, no cellphone contract, LUTHO, I paid it all up without having to go through debt review. I do have a retirement annuity, as well as life cover. I also just recently paid my first Satrix debit order and I’m happy I was doing some things in your book that were recommended. I just want to finish paying off the car loan and start saving towards a deposit for a home, as you recommend in your book. Please help with any advice of how I can pay that loan off faster? My only regret is I wish I had read your book before I started working two years ago. I know I would have made better choices, but I’m glad it came when it did. Although I’ve made mistakes (buying a car I can’t afford), I now know better. Thank you for that wonderful book, I wonder if you know how amazing you are and how many people including myself you have helped and will continue to help. My husband brought me the book ‘From Debt to Riches” home from work. I am not much of a reader but I could not put it down. I read it in two days and I must say I have never had so many “AHA” moments like that in my life. I wish somebody had handed me this book 23 years ago when I was 23 and starting my first job. Simply written, easy to understand and it is very life changing indeed! I managed to cancel my credit life insurance that they gave me when I took a personal loan, saving me R546.00 which I have put into my loan repayment! Phumelele you are really my LeadSA hero of the century! Thank you for your willingness to share your financial wisdom with ordinary women like myself. Blessings, Blessings and more Blessings! I DID IT!! I DID IT!!! I DID IT!!! I finally paid off my UNISA debt. I’m debt free. A few months of giving up comfy living and I finally paid off my outstanding fees! I’m just super-excited. Thank you so much for your guidance and your wonderful book. I have been subscribed to your ThuthukaSA newsletter for almost two years now. I may be in the finance field but I am quite clueless with everyday living when it comes to my money. The topics you tackle are actually topics I want to hear and read about as a young person. I am not in any debt nor am I investing anywhere. I am 25 years old, unmarried and still a trainee. I have one account with Game (I took a fridge when I moved from res to a flat). I recently took out a credit card with my bank for “emergencies”. It’s been two months with the card and I haven’t used it. I don’t intend using it foolishly. The temptations are there but not enough to make me use it. I also opened a savings account with my bank, where I put I put away however much I can every month and I can withdraw the money whenever. My current account and savings were linked and whenever I ran out of money in my current account, I didn’t worry because I could use my savings. So I realised I’m defeating the whole purpose of the savings account! I no longer have them linked and I have managed to keep my savings for the past two months. Early stage , I know, but it makes me feel good and motivated to carry on. I have read all the horror stories of debt and my fear of being in debt has helped me not to venture into clothing accounts since my varsity days. My friends and colleagues are sinking in clothing store debt, while I managed to buy what I wanted and needed in cash. I’m venturing into a new chapter in my life. I want to be in control of everything and to be aware of what I let into my life and pockets. And since I have been following your advice in some instances through the newsletters, I decided to make From Debt to Riches my first read. My life coach has instructed me to read more and frankly, I find your book worth reading as it will widen my understanding of my finances. And what better way to grow as a person than to first be in charge of ones finances. So my email is basically a “thank you” for the work you do. A thank you for the teachings. A thank you for the changes you are about to factor into my life through your book. I will definitely keep emailing you as I progress. God bless you in many, many ways!! 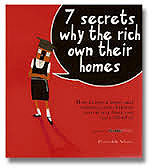 Phumelele Ndumo’s first book “7 secrets why the rich own their homes” is SOLD OUT and will NOT BE REPRINTED!